SimpliSafe promotes its home-security system as a less-expensive alternative to professionally installed systems you can buy from service providers such as ADT and Vivint. You buy the equipment outright, install it yourself, and there’s no long-term contract—even if you sign up for the optional monitoring service. But before you jump on this deal, know its limitations: The SimpliSafe system doesn’t support smart door locks, lighting controls, security cameras, or programmable thermostats. So if you’re looking to convert your house into a smart home, this isn’t the way to go. Even if you don’t care that entering the right code in your deadbolt can automatically disarm your alarm system, or that a camera gives you a remote look at your house if the alarm goes off while you’re away, we consider lighting controls to be an important part of a home-security system. Here’s why: We like the idea of having the lights turn to frighten an intruder who trips the alarm, and to light your way out of the house if your smoke detector or carbon-monoxide detector warns of dangerous conditions inside. This columnar base unit is the heart of the SimpliSafe system. It monitors all the sensors and houses a siren and a GSM module, among other things. So we’re dinging the SimpliSafe system reviewed here a half-star for not having those features. If those shortcomings don’t bother you, you can mentally add it back, because it’s otherwise a very good product. Installation, for instance, is very simple and do-it-yourself—no technician needs to come out to your house, and you can take the equipment with you if you move. SimpliSafe offers professional monitoring on a subscription basis, but that service is optional and there's no long-term contract. I’ll go into more detail on that later. 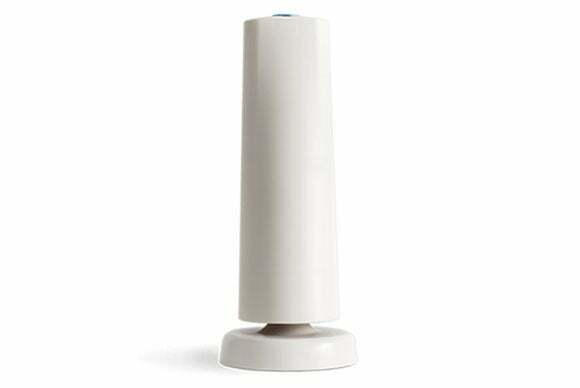 The base unit is the core of the SimpliSafe system. It's an 11-inch-tall rounded tower that houses a siren, a buzzer, a speaker, and a GSM module that establishes a cellular connection to the monitoring office. (A burglar can easily defeat an alarm system that relies on a landline by cutting an exterior cable.) The base unit runs on AC power, but has a battery backup, so a burglar can’t defeat the alarm system by cutting off power to your home, either. SimpliSafe says the battery will last at least eight hours. The other core component is a keypad that you mount near your door. You’ll use this to activate the alarm when you leave the house, and to disable it when you come back. While you're home, you can arm all aspects of the system except for the motion sensor, so you have protection while you're home, too. Apart from the base station, everything else runs on battery power, so you don’t need to worry about stringing wires all over the house. Mount this numeric keypad near a commonly used entry/exit door. You'll use it to arm and disarm the alarm. Once the base station and the keypad are installed, you set about installing the various sensors. SimpliSafe offers open/close sensors for your doors and windows, motion sensors for rooms, water and freeze sensors, smoke and carbon-monoxide detectors—there’s even a sound sensor that responds to the specific frequencies of breaking glass. (The setup guide warns against putting it in the kitchen.) One base unit can support up to 41 of these sensors. There’s also a “panic button” to put on the wall next to your bed that you can press to activate the alarm. A keychain remote, which also has a panic button, lets you arm and disarm the system if you’re not within reach of the keypad. There’s also a second siren that’s much louder than the one in the base unit, and it's weatherized so that it can be installed outdoors, if you prefer, to notify your neighbors (presuming you're on good terms). The boxes SimpliSafe's sensors come in have “quick tips” printed on them, such as “a solid yellow light indicates that the smoke detector is not securely mounted on its bracket.” These tips are a good example of how SimpliSafe holds your hand through the setup process. When you first plug in the base unit, a female voice (not a robot) welcomes you and tells you it’s ready for you to start installing devices. One of the keychain remotes in my kit was also a thumb drive with a setup animation stored on it. The animation didn’t work on my Mac; but there’s also an installation video on SimpliSafe’s website that walks you through the basic process. This system definitely earns the “simple” in its name. 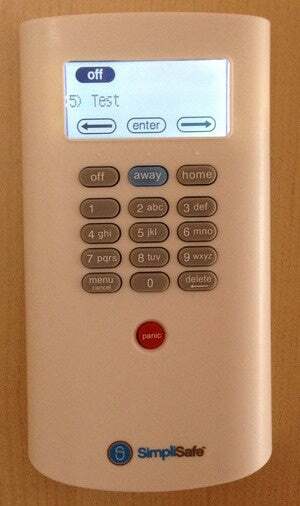 Keychain remotes like this one allow you to disarm the system before you enter the house, and arm it after you exit. 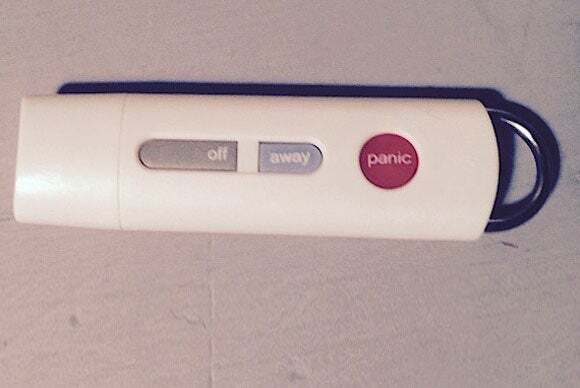 The panic button will sound the alarm in an emergency. After getting the system set up, it was time to test it. I didn’t bother to test the actual alarm sirens—the base unit’s siren is 85 decibels, which according to various scales is about as loud as city traffic or trucks going by. The satellite siren is 105 decibels, or as loud as a jackhammer or power mower. Since I live in an apartment, I decided not to subject my neighbors to these noises and to assume that if the test mode worked, the alarms would, too. Use the keypad to put the system in test mode, and the voice from the base unit will confirm the setting. You can then press buttons on the various sensors, and the base unit announces which sensor is being tested. For the motion sensor, you press the button, wait a while, and then walk in front of it. The base station will announce “motion sensor” to confirm. It’s a reassuring way to test that the batteries and communication links are sound. But it doesn’t reveal anything about the actual alarms. I started wondering, does the siren go off if the water sensor detects a leak? That would seem like an overreaction. The smoke and carbon-monoxide detectors make their own familiar piercing shrieks—do they set the siren off as well? And how do you know which device triggered the alarm? 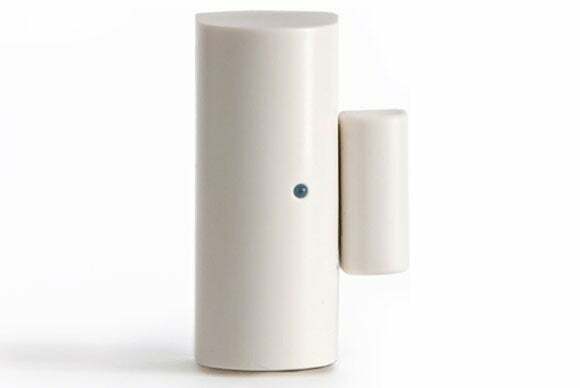 SimpliSafe's two-piece door/window sensors are large and difficult to disguise, but they do the trick. According to SimpliSafe, the siren sounds for the door and window sensors and for the smoke and carbon-monoxide detectors. The freeze and water sensors trigger a sound the company described in an email as “more like a buzzer than a siren.” The base station also announces which sensor—water or freeze—triggered the alarm. But if your pipes are in danger of freezing, or if they leak or burst, the system offers no way to mitigate the damage because it can't connect to a thermostat (so it can’t turn on the heat) and it doesn’t link to a motorized valve that can turn off the water. Some more sophisticated (and more expensive) alternatives do offer these functions. Sounding local alarms is all the SimpliSafe system does unless you spring for its subscription monitoring service. The $15-per-month standard plan buys just live monitoring, where a dispatcher (from the third-party service COPS Monitoring) will contact the police or fire department in response to an alarm. For $25 per month, you get that level of service plus SMS and email alerts; the ability to arm and disarm your system remotely, using your smartphone; remote ability to check the status reports on your burglar, fire, carbon-monoxide, and flood sensors; and an event log for tracking when the system is armed and disarmed. The remote control and the notifications are the extent of this system’s interactivity. SimpliSafe is a self-contained system that doesn’t talk to devices outside its ecosystem. You can’t set up the motion sensor turn on a light via another company’s lamp switch, for example, or trigger a camera to record a video clip if the alarm goes off until SimpliSafe comes out with its own (due in early 2016). 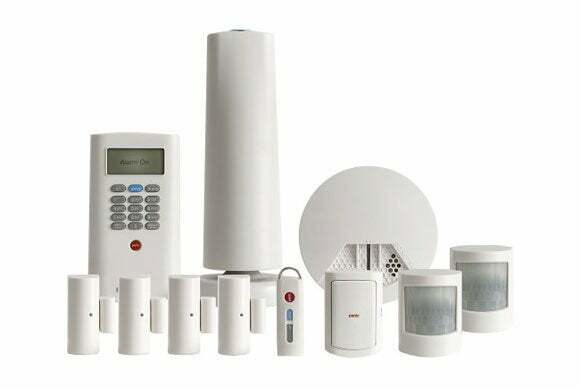 That said, SimpliSafe makes a lot of devices and offers a range of system packages. The Starter package, at $230, includes the base station and keypad, one motion sensor, one door/window sensor, and one keychain remote. At the other end of the scale, the $540 Ultimate package comes with two motion sensors, four door/window sensors, two keychain remotes, a panic button, the extra siren, one water and one freeze sensor, and one smoke and one carbon-monoxide detector, plus the base station and keypad. You also get yard signs and window decals that might deter anyone from testing your system in the first place. If those bundles don’t fit your needs, you can build out your own package by starting with the base unit, keypad, and keychain remote, and then adding whichever other components you choose. Whether the SimpliSafe system is right for you depends on if you want just a security system or if you’re interested in laying the foundation for a truly connected home. There’s nothing to stop you from installing smart lighting, a programmable thermostat, or any other connected-home components alongside SimpliSafe, but you’ll need to manage them independently of your security system. In short, SimpliSafe will make your home safer, but it won’t make it any smarter. SimpliSafe provides an easy way to add an alarm system to your home, with professional monitoring as an available option. But it won't form the foundation for a connected system, and it doesn't support security cameras, thermostats, or lighting controls. Jake Widman is a freelance writer in San Francisco and a regular contributor to Computerworld, PCWorld, and TechHive.